You better show what you mean instead of describe it! With Screen 2 WebFlash you can record screen action and save it as Flash movie for your website! Create online tutorials fast and easy! You can show everything you want. For example how to use your software if you are a software developer. Or how to solve a computer problem if you maintain a website about computer problems. You can add texts, pictures and graphic objects after recording or change the exiting objects. The picture will be stored as JPEG images inside the flash files, that means small files. Only the parts of the screen that has changed will be stored inside the Flash file. The mouse movement is stored as Vector animation, so this will take as good as no disk space. If a button is pressed only this button will be drawn again. Flash files are very small, so they are very good for using them on your website. Flash files are the best solution for Internet animation today. If you want to design flash movies you need Flash-creator. Screen 2 WebFlash was awarded with 5 of 5 stars by software directory shareup.com. Screen 2 WebFlash was awarded with 5 of 5 stars by software directory BrotherSoft.com. Screen 2 WebFlash was awarded with 5 of 5 stars by software directory softaward.com. 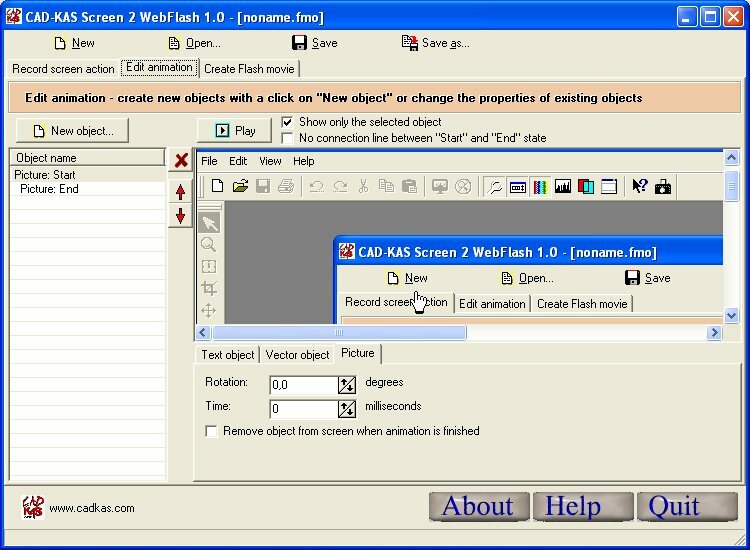 Screen 2 WebFlash was awarded with 4 golden disks by software directory globelshareware.com. Screen 2 WebFlash 1.0 was awarded with 3 cows by software directory tucows.com.